Unfortunately, the dress you are looking for (Style: DQ-9281, Name: DQ-9281) is no longer available. Billowing chiffon and sparkling jewels make this fabulous long prom dress ideal for a special evening or romancing and dancing. The classic sweetheart neckline of this captivating long formal dress has a modern twist with delicate lace over sheer illusion mesh. Jeweled bands at the high neckline and natural waist add the perfect touch of sparkle to this elegant sleeveless evening dress. As you turn around, beautiful sheer lace frames the daring open back for a surprising twist. The glamorous gown has a floor-length flowing chiffon skirt that creates a figure-flattering silhouette for any figure type. 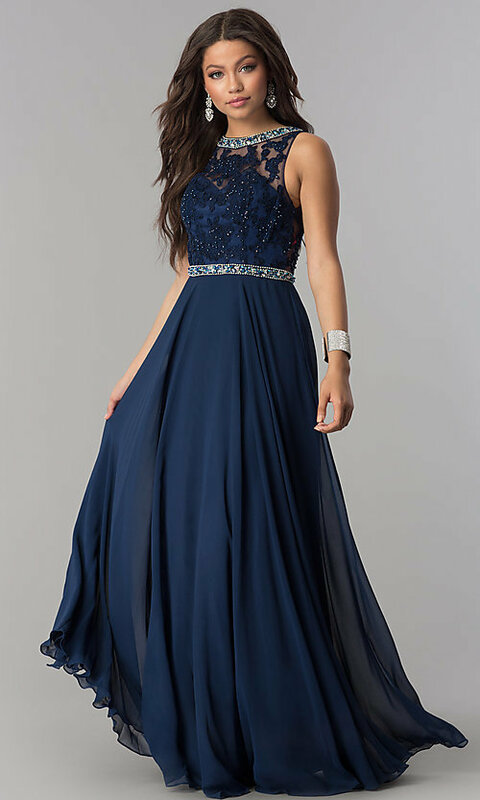 An affordable style choice as a bridesmaid dress or military ball gown, this long chiffon prom dress, under $150, is available in misses and plus sizes. The model is 5' 9.5" and wearing 2.5" heels. 62", Hollow to Hem 61"